For a character whose defining trait, for years, was that she'd been shot, Batgirl sure is good at dodging bullets. Inspired by Batman, Barbara Gordon fought Gotham City evildoers as Batgirl. But when the Joker shot her in the spine, she was confined to a wheelchair indefinitely. Determined to walk again, Barbara trained intensely and was able to resume her work as te crime-fighting Batgirl. Although her traumatc memories will not easily fade, she can once again be seen fearlessly swinging over the rooftops of Gotham City as a sign of hope and perseverance. When Batgirl was announced as one of DC's New 52 books, the only thing keeping the fans from rioting over the de-crippling of Oracle was the fact that the book was being done by Gail Simone, the writer who made her bones with the character in Birds of Prey. And we really mean "the only thing": when a new editor wanted to change writers, fans and pros alike pitched an internet hissy fit, and she was back on the book after missing only two previously scheduled fill-in issues. Bullet? Dodged! So DC Universe Classics ended after 20 series due to a lack of retail support. Then there was supposed to be DC All-Stars, but that idea fell apart. So now there's the online-only DC Signature Collection, plus two retail lines: DC Unlimited, which is the catch-all line, and the more focused Batman Unlimited, of which Batgirl is a part. What we can't figure out is how these figures can both cost less than DCUC and have 100% unique sculpts. We were told repeatedly that reusing sculpts was done to keep costs down, and yet here we are with entirely new molds. Are build-a-figure pieces really that expensive? Or was Mattel just engaging in its usual price-gouging? 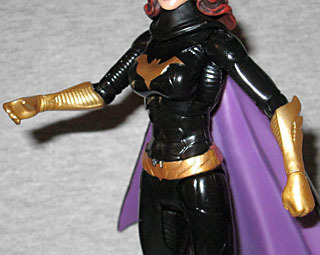 Anyway, Babs has an incredible sculpt that doesn't skimp on any of the New 52 detailing. She's got ribbed panels on her arms and legs, plus distinct armored plates over the rest of the body. Her chest symbol is raised and her utility belt is a unique pattern. Her boots are detailed all the way down to the soles, but the mold of the hands feels a bit soft - those may be reused sculpts, so it could make sense that the detail is getting lost. In sculpting an entirely new body, Mattel or the Four Horsemen took the opportunity to also put in some new articulation. Some of the joints are the same that we're used to: the balljointed head that barely even works as a swivel, the swivel/hinge shoulders, the swivel wrists, the swivel/hinge hips, swivel thighs, and hinged ankles. Even the torso joint is something they've done before. What is new, and very surprising, is the elbows and knees. They're swivel/hinge joints, like Hasbro uses! In the case of the legs they're superfluous (because of the thigh swivel), but it works well on the arm. Oh wait, the swivel part of the knee is below the joint, not above, so it doesn't actually duplicate the same range of motion. My figure ended up with two left knees, but you can't really tell except on close inspection thanks to the colors. While New 52 Batman is a boring lump of grey, Batgirl mixes things up a bit. 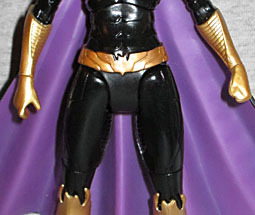 Her costume is gloss black, while her cape and cowl are matte. 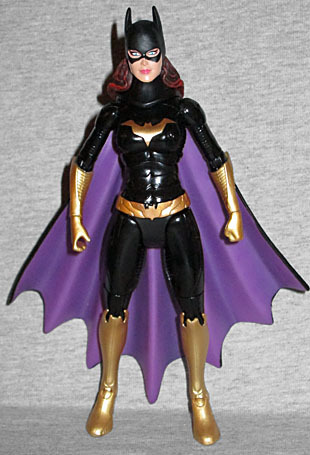 The lining of her cape is purple, meaning her body is in contrast no matter how she's posed, and the boots, gloves, belt and batsymbol are all done in gold. Her hair is perhaps a bit darker than it should be (given the way it's colored in the comics), but you can pretend that's an effect of the night. She has no accessories, but her right hand is open; if you have any extra batarangs lying around, she could theoretically hold one. Batgirl is a perfectly fine book, but it's certainly not among the best of the New 52 relaunches (which suggests that the outcry about them firing Gail had more to do with her fame than her work). That said, we doubt anyone else could really have done any better. 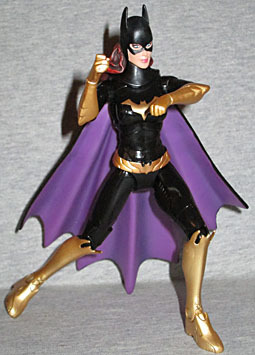 And bringing back Batgirl means we get this really good figure, so consider it a win all around.